William Henry Harrison was a well-known “dark horse” President – if such a thing is possible. 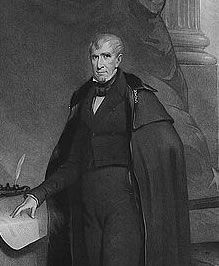 Contrary to the myth, William Henry Harrison (1773-1841) was as well-born as any First Family of Virginia could be. His family dated back to the early seventeenth century. They had enormous land holdings and political clout. His father, Benjamin (the 5th of that name) was one of George Washington’s adjutants and an early Governor of Virginia. 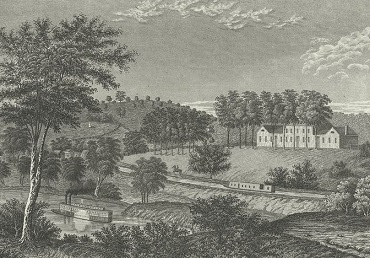 Even though Ben-V died when William Henry was only eighteen, the youth had numerous opportunities to be in the august company of Virginia notables. But WH was the last child of a large family, and a) due to his father’s death, and b) numerous elder siblings, the family fortune was spread thin. WH received a small share; but he did receive a fine classical education. He studied first at Hampton-Sydney College in Virginia, and later at the University of Pennsylvania, where he studied medicine. Briefly. Opting for military service rather than medical practice, he nevertheless had absorbed enough doctoring to tend to his/his family’s health, and even some of the soldiers in his command. 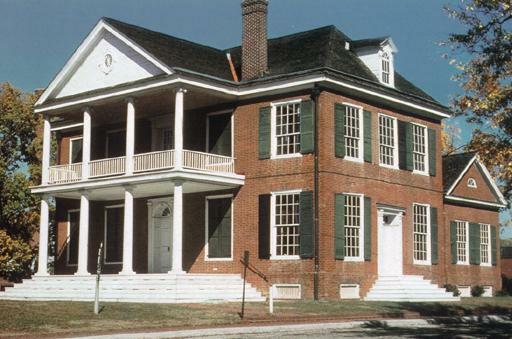 Harrison’s home in Vincennes, IN. It still exists. William Henry Harrison was fast-tracked as a soldier. George Washington signed his commission. He received early promotions and did not disappoint. As the country grew, he was elected the first Congressman (non voting) of the “Northwest Territory,” and a year later, its Governor. He built a very nice house in Vincennes, IN. Being reinstated in the army as a General, he gained fame in the Indian Wars of the early nineteenth century, notably at the Battle of Tippecanoe and at The Thames. 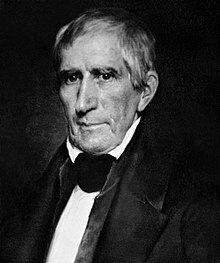 Since those “battles” were considered part of the War of 1812 (and the US needed every victory it could claim in that lopsided episode), William Henry Harrison indeed became famous. He was named Governor of the Ohio Territory – much larger, and much more important. He built another very nice home in North Bend, Ohio. Harrison’s plantation in OH. It no longer exists. After that, his fortunes were mediocre, and while he held some modest positions, for the next twenty years he consistently lobbied for better sinecures. By the late 1830s, he was getting a bit long in the tooth, short in the talents, and generally overlooked. But by the 1830s, the dissatisfaction with President Andrew Jackson on various fronts spawned what would become the Whig Party: a motley assortment of partisans of those various fronts. In 1836, the newly named Whigs ran FOUR candidates for President (one of whom was WHH), knowing that they would all lose, but hoping one would emerge for the future. William Henry Harrison polled the best and was indeed their standard bearer for 1840. It was name recognition, plain and simple. The Log Cabin and Hard Cider image. It exists forever. William Henry Harrison was happy to be the standard bearer, but the Whig politicians realized that the old General needed to be on a fairly short leash, believing that the more he spoke, the more he votes he might lose. Oddly enough, when the Democratic supporters of incumbent Martin Van Buren pooh-poohed Harrison by suggesting that “if you gave him a log cabin and a jug of hard cider he would happy for the rest of his life,” in a stroke of inspiration bordering on genius, the Whigs turned the slur into one of the greatest political attributes of all times. He was now portrayed as a “man of the people,” rough-and-tumble, and someone like themselves. The country went wild for “Old Tippecanoe” as they called him. They paraded, designed log cabin floats and banners, made silk scarves and posters, and whatever bits of stuff and nonsense attracted attention. Songs were written. Dignitaries gave speeches. Lots of hard cider was distributed. It was fun! But… the savvy politicians did whatever they could to keep the candidate from public utterances himself. He would be the standard bearer, but not speaker. Daniel Webster, the foremost orator of his time. 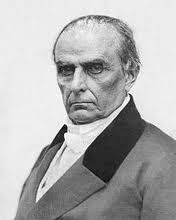 Daniel Webster (1782-52) was a well known Senator in 1840. He was also a hugely regarded orator and a Whig. A daguerreotype of President Harrison. An experienced speaker like Webster understood cadences and pauses, and approximations of how long it takes to read a page aloud. The Harrison original would go on all day! The classically trained Harrison had penned a classical oration, full of flowery language and numerous references to Greek and Roman antiquity. It was a far cry from what the log cabin and hard cider enthusiasts wanted or expected. Most of them had no idea who those ancients were or what Harrison was trying to say. Nor did they care. Nevertheless, Harrison gave his windy speech on March 4, 1841. It was also a windy, cold and nasty day. Attempting to project the log-cabin image of hardihood instead of a man near seventy, he wore no coat, nor hat, nor gloves. He spoke for two hours. He caught cold. It turned into pneumonia. He died within a month. This entry was posted in A POTUS-FLOTUS Blog, Nifty History People, William Henry Harrison and tagged "Old Tippecanoe", American history, Andrew Jackson, Battle of The Thames, Battle of Tippecanoe, Benjamin Harrison V, Daniel Webster, Feather Schwartz Foster, First Families of Virginia, General William Henry Harrison, history, Martin Van Buren, President William Henry Harrison, Presidential history, Secretary of State Daniel Webster, Senator Daniel Webster, The election of 1840, The Whig Party, US history, White House history, William Henry Harrison. Bookmark the permalink.